We’d love your help. 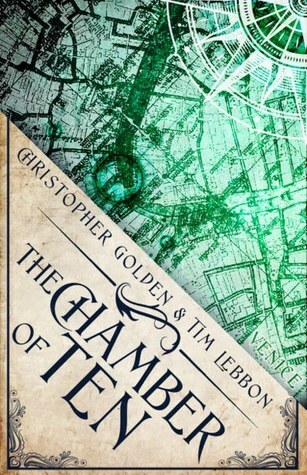 Let us know what’s wrong with this preview of The Chamber of Ten by Christopher Golden. From two masters of dark fantasy comes a chilling tale of magic and possession, set in--and beneath--fabulous Venice, a city slowly being swallowed by the very waters that have made it one of thewonders of the world. Geena Hodge is an American archaeologist working to salvage Venice's past from the encroaching Adriatic Sea. When she and her lover, Nico, discoverthe lost li From two masters of dark fantasy comes a chilling tale of magic and possession, set in--and beneath--fabulous Venice, a city slowly being swallowed by the very waters that have made it one of thewonders of the world. Geena Hodge is an American archaeologist working to salvage Venice's past from the encroaching Adriatic Sea. When she and her lover, Nico, discoverthe lost library of Petrarch under the Piazza San Marco, they rejoice not only at the historical significance of the find but at the opportunity to bring worldwide attention--and much-needed funding--totheir endeavors. But that find soon leads to another, a room buried more deeply still: the fabled Chamber of Ten, where centuries ago the secret rulers of Venice, in their quest forabsolute power, met to plot betrayals and murders. After entering the Chamber, Geena and Nico are thrust into the midst of an ancient feud, a deadly battle of wills and black magic that threatens to poison thecity's future with the evils of its past. To ask other readers questions about The Chamber of Ten, please sign up. Just found it too slow and too dull. I found Geena annoying and Nico a prat, and as they are the two main characters, that makes reading the book a hard slog. Geena Hodge is an archeologist working in Venice. While working her team finds what is thought to be the lost library of Petrarch. As exploring the room they find another room that is hidden and way below the water level. It is a complete mystery as to why both rooms are still dry until Nico, Geena’s boyfriend, breaks an urn. At that moment the rooms flood then Nico starts acting strange. It seems that Nico has become possessed by a powerful magician from hundreds of years ago. What follows is a Geena Hodge is an archeologist working in Venice. While working her team finds what is thought to be the lost library of Petrarch. As exploring the room they find another room that is hidden and way below the water level. It is a complete mystery as to why both rooms are still dry until Nico, Geena’s boyfriend, breaks an urn. At that moment the rooms flood then Nico starts acting strange. It seems that Nico has become possessed by a powerful magician from hundreds of years ago. What follows is a story from present time and the battle of the Group of Ten in the 15 and 16 century. I loved the history and the back and forth in the story. I felt for Nico as he tried to fight for control of his mind with the magician. I really liked this mystery and though this was a great story. But I have to say that Geena seemed to push my buttons and acted like a silly school girl with a crush instead of the professional archeologist with a BBC documentary being filmed of her. Her behavior really drew the story down. Although it is still good I am sad to admit that I didn’t like it as much as the first two books in the series. I really hope The Shadow Men is better. I wanted to like this book, and I really tried to like this book. Unfortunately, I didn't like this book. In fact, I didn't like it so much that I couldn't force myself to finish it. The premise sounded interesting - a story inside a story, present day archeologist Geena is working on cataloguing a major find in Venice - Petrarch's lost library. When she and her team, one of whom is also her lover, Nico, unexpectedly find another room under the library, which is already under sea-level, but mirac I wanted to like this book, and I really tried to like this book. Unfortunately, I didn't like this book. In fact, I didn't like it so much that I couldn't force myself to finish it. The premise sounded interesting - a story inside a story, present day archeologist Geena is working on cataloguing a major find in Venice - Petrarch's lost library. When she and her team, one of whom is also her lover, Nico, unexpectedly find another room under the library, which is already under sea-level, but miraculously undamaged or even touched by water, they start to explore it. But when Nico finds what appears to be an urn and then drops it, water pours in, destroying what hasn't already been moved above ground, and trapping Nico under the water. Nico begins to act strangely, and then takes off. It is then that we start to find out about the centuries old battle among ancient Venice's Group of Ten, the men who helped the Doge rule. We discover that Nico has been possessed by the spirit of one of these long ago men, who happens to have been a powerful magician, and who has an agenda that won't stop just because he's been dead for several hundred years Note: this isn't a spoiler, because this is presented early in the book and represents a key part of the succeeding plot. I had a couple of issues with this story. First we're told that there is a "special" bond between Geena and Nico, that allows the two of them to feel each others feelings, thoughts and emotions, and to always feel where and how the other is. While I read all kinds of paranormal fiction and have a pretty high tolerance for magical, mystical and types of unexplainable things, including connections between people that go beyond the norm, the thing between Geena and Nico came across as contrived, melodramatic, and, frankly, just ridiculously unbelieveable. It irritated me everytime this came up, and distracted me from the story. I also had a hard time accepting that Geena - supposedly a scientific person and a scholar, could so easily fall into acting like a heroine from a Harlequin Romance novel. She immediately and almost without a thought takes off after Nico when he goes awol, ignoring her professional responsibilities - which include a BBC film crew making a documentary of her project that could make or break her career - and completely losing touch with reality in her obssession with what's happened to Nico. The only part that I could partially get into was what was happening to Nico - being possessed by the ancient Venetian magician guy. I really wanted to hear more about that aspect, both in the present with Nico battling to keep control of his own mind and body, and the past story of what went on among the Group of Ten that eventually led not only to murder, but to an agenda that transcended centuries into the present. A great third effort in the "Hidden Cities" series. This installment takes place in Venice. The story is told from the point of view of a couple, Geena and Nico. They are both archaeologists working for a local University, and are working together on a project Geena is heading. The project is the discovery of a hidden vault under the library filled with old books. From centuries ago. Geena believes it to be the mysterious lost library of Petrach. As they are exploring the underground room, the f A great third effort in the "Hidden Cities" series. This installment takes place in Venice. The story is told from the point of view of a couple, Geena and Nico. They are both archaeologists working for a local University, and are working together on a project Geena is heading. The project is the discovery of a hidden vault under the library filled with old books. From centuries ago. Geena believes it to be the mysterious lost library of Petrach. As they are exploring the underground room, the find a door to an even lower room. They can't understand how they can be so far below the water level of Venice's famous canals, and yet have no water leaking into either room. All of the books have been preserved in a pristine fashion. There isn't even a hint of damp. As the team progresses down into the lower chamber to explore their newest find, they notice that the new chamber is quite strange. It has three obelisks in the center of the room, they look like pillars but are not supporting the ceiling. There are ten markers spaced evenly in a circle around the room. The door and all the markers all bear the legend: "X". And on a shelf in the wall, a jar... or is it an urn? Nico has some sort of natural inclination towards psychic powers, and he can project speech, thoughts, and emotions into Geena's mind. Likewise, he can feel her thoughts and emotions that she attempts to project towards him. Unfortunately, while they are exploring the chamber, something terrible happens that none of them can quite explain at the time, nor even when they re-watch footage that had been filmed at the time. This is the start of a mystery that Nico is dragged into, and because of their close mental connection, Geena along with him. Decent enough if you can stick it out but you’ll need a lot of patience. Overall, if you’re a fan of James Rollins works, this would probably fall into the same category but it’s not as action-packed nor as well written (not that Rollins' work qualifies as "high art" either). It wasn't until I started the book that I found out it's third in a series. The tricky part here is that the two main characters, Geena & Nico, have a telepathic bond which took some getting used to. To the characters a Decent enough if you can stick it out but you’ll need a lot of patience. Overall, if you’re a fan of James Rollins works, this would probably fall into the same category but it’s not as action-packed nor as well written (not that Rollins' work qualifies as "high art" either). It wasn't until I started the book that I found out it's third in a series. The tricky part here is that the two main characters, Geena & Nico, have a telepathic bond which took some getting used to. To the characters and readers already familiar with the series, this is old news. But for new readers it takes some time to absorb. The main problem I saw was that nothing really moving occurs until the halfway mark in the book. The authors wasted way too much space with the Geena-and-Nico-are-secret-lovers-but-almost-everyone-knows shtick. It was beyond tiring. And, maybe it's just me, but the whole "possessed by an ancient spirit" deal seems trite. I mean, name a show dealing with science fiction or fantasy that hasn’t had this as a plot device. That’s not to say that it should be stricken from literature but most of us are familiar with the concept so you don’t need to treat it like we’ve never heard of it. The first half of the book dealt too much with the aforementioned (not)secret romance and “oh so this is how it feels to be possessed” interior monologue. However about halfway into the book, as I’m just getting to the point where I’m considering quitting, the story starts to pick up: a little more action, some neat historical tie-ins (e.g. the Oracle stuff was inventive), less handwringing from Geena (“Oh, I guess they know Nico & I are sleeping together”), etc. There still seemed to be too many pointless interludes and the climax was kind of hokey. I think the authors did make a genuine effort to convey the atmosphere of Venice without letting it overpower the story. I guess I would recommend the book with a “give it a try” but caution anyone that if you’re looking for a high action thriller, you’re going to have to wait until the middle before the pace picks up. Bestselling authors Christopher Golden (The Boys Are Back in Town and Baltimore) and Tim Lebbon (Dawn and Desolation) continue with the next Hidden Cities book after Mind the Gap and The Map of Moments, and this time they travel to the enchanting, historical city of Venice. Geena Hodge, an archaeologist, is working with her team at the Biblioteca Nazionale Marciana when they come upon a hidden door. A documentary crew is also with them from the BBC covering these last discoveries as Venice conti Bestselling authors Christopher Golden (The Boys Are Back in Town and Baltimore) and Tim Lebbon (Dawn and Desolation) continue with the next Hidden Cities book after Mind the Gap and The Map of Moments, and this time they travel to the enchanting, historical city of Venice. Geena Hodge, an archaeologist, is working with her team at the Biblioteca Nazionale Marciana when they come upon a hidden door. A documentary crew is also with them from the BBC covering these last discoveries as Venice continues to sink beneath the waters. Behind the door they discover the hidden Chamber of Ten, belonging to a secret group from the fifteenth century that controlled the city and the Doge. Then a wall breaks and the Venetian waters begin flowing into the hidden chamber and filling it up, as the team does everything they can to rescue the documents and artifacts before everything is under water. As time passes and excavation on the sunken chamber begins, Geena finds herself experiencing some very strange visions of a past time with dark magic and powerful people. Then there’s Nico, a member of the team who is also Geena’s lover, and is a person with telepathically abilities who finds himself possessed by someone from the past with great power. After the success of the great Map of Moments, The Chamber of Ten falls short of being a good novel, feeling rushed and over the top, with simple characters, and little going on other than ham-handed “black magic” and outlandish action scenes. However, there has been some research done here on old Venice, which is shared with the reader, along with descriptive scenes of the beautiful Italian city. Originally written on September 29 2010 ©Alex C. Telander. I was intrigued when I first picked it up and continued to be enthralled by the way it was written and how the story was developed. But the ending was a little disappointing. It went by too quickly and I felt dissatisfied because there could have been a little more than what was written. It's the only reason why I don't give it 4 stars. Other than that, I enjoyed how it was written and the plotline itself was magnificent! Pedestrian suspense thriller, with speculative fiction elements. Thin characters, blasé magic, and superficial atmosphere make it hard to get engaged. Best part: Venetian history. Best character: the villain (of course). Most tiresome: play-by-play emoting inside the head of the female protagonist. It's a made-for-TV movie, targeting women, to sell them European-style frozen entrées. This pair of authors never disappoints. Fast paced, creepy, good puzzle to solve. I enjoyed this one, but it seemed more mainstream than their usual gritty scariness. Four out of five for these two and this enjoyably creepy story. The Chamber of Ten snaps along with magical shock and awe. Grab a beverage, a beach chair and enjoy the macabre machinations. Interesting concept. Not at all what I expected, but it was very good! Set in modern day, with an archeological group, throw in historical figures a little dark magic, and you've got a good read! Lacked a bit in comparison to the last book. The characterization didn't seem quite as well done and it was more predictable but still it wasn't bad. Also a great book, this time it's set in Venice, and the Hidden places beneath. Compeling story, if implasible, but it kept my interest! I should have paid more attention to the cover. There are a lot of "magic" and supernatural powers in this book. Not quite what I was looking for.